Several dozen people gathered in the sun outside the Mountain View Community Center Sunday afternoon for a veterans’ memorial event organized by the Hmong Alaska Community, Inc.
It’s the second such event this week. Thursday, local lawmakers, veterans and their families marked Hmong-American Veterans Memorial Day with speeches and ceremony at Mountain View Lions Park. The observances are intended to honor Hmong veterans who served alongside U.S. forces in the Vietnam War. More than 40,000 lost their lives. According to the Hmong American Partnership, more than 3,500 Hmong now call Alaska home. Click here to read one local veteran’s story. 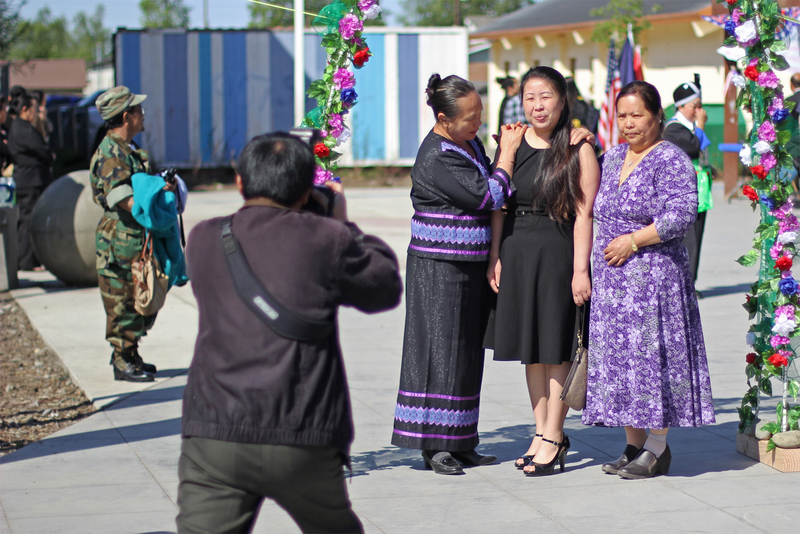 A family poses for a photo at a Hmong veterans memorial event at the Mountain View Community Center May 18.